No environmental condition can do more damage to your instrument than low relative humidity (RH). Many areas of the U.S. experience naturally low humidity all year long. The Rocky Mountain region, for example, has notoriously low RH levels, as do Phoenix, Reno, Las Vegas, and a number of other cities. In most regions of the country, however, low RH levels accompany the onslaught of winter, mostly due to the effects of artificially heating our homes and buildings. If you’ve read the various references to humidity-related problems published in our newsletter, Wood&Steel, you know that the colder months wreak havoc on acoustic guitars made of solid wood. 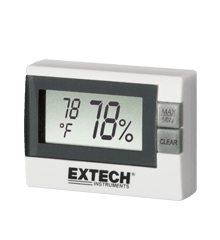 As the weather turns wet and temperatures fall, there is a natural tendency to crank up indoor heating units. Unfortunately, what many don’t realize is that heating a room forces the relative humidity down to a level that poses a real threat to quality acoustic guitars by literally drying them out. The bottom line regarding dryness is that if your guitar is not kept within a comfortable range of 45-55 percent relative humidity, it will be in danger of cracking. We strongly recommend the use of a guitar humidifier, along with a digital hygrometer to accurately measure the humidity level where you store the guitar. (Please consult the Taylor Tech Sheet, “Using a Guitar Humidifier,” for tips on using humidifiers.) The following information will detail the adverse effects of dryness on guitars, the characteristic indicators of severe dryness, and the steps one can take to counteract those effects. Occasionally, we get a call from a customer who is frustrated because of some “string buzz” issues on his guitar. He or she may notice the strings are closer to the frets than when it was new. The strings “buzz” even worse when played in the high registers, but it would seem that raising the saddle enough to rectify the problem would result in an uncommonly high saddle. In such cases, we immediately recognize that the guitar has “dried out,” thus causing a number of related problems: The arch in the top sinks, taking the bridge with it; the neck bows forward, necessitating a truss rod adjustment; and the fingerboard shrinks in width, causing the sharp ends of the frets to extend beyond the edge of the neck. Combined, these events can make a guitar look like it has a badly made neck. Actually, the neck is fine — the problem is with the body, and that can be corrected with a truss rod adjustment and the use of a guitar humidifier. However, many customers still find it hard to believe that so simple a solution as humidifying the body will fix what appears to be a grave problem with the neck. Let us convince you. When we make a guitar, the wood first is dried, or “seasoned,” and acclimated to a certain moisture content. As a result, all guitars leave the factory in the same condition, and all will react more or less the same when exposed to changes in humidity. Our factory is climate-controlled to maintain a temperature of 74 degrees and a relative humidity of 47 percent. This consistency causes the wood to equalize at a specified moisture content ideal for building guitars. As the wood’s moisture content changes, so does the size of the wood. Spruce, in particular, shrinks and expands a tremendous amount as it gains and loses moisture. For example, let’s say we condition a spruce top in a room that is 47 percent RH, and then cut that spruce to a width of 16 inches. If we then were to lower the room’s RH to 30 percent, that same piece of spruce would shrink to 15.9 inches in width — shrinkage of almost 1/8 of an inch! If, instead, we were to raise the room’s RH to 60 percent, the spruce would swell to 16.06 inches, an expansion of almost 1/16 of an inch. While our wood drying and conditioning methods minimize this movement, wood is still wood, so even after it becomes a guitar, significant fluctuations in humidity will cause the wood to shrink or grow. The reason we prefer 47 percent RH is because it is a very “normal” or “median” humidity. When built at that RH level, a guitar can be exposed to more or less humidity and still perform well. The more extreme the temperature and/or humidity fluctuations, the sooner the guitar will be adversely affected. The good news is that your guitar can be protected from many changes simply by storing it in its case, which will help protect the guitar and slow down the ravages of low humidity. If it does become too dry, both its moisture content and its shape can be restored by exposing it to humidity. A guitar humidifier accomplishes this very well. For reference, look at the accompanying photos of a guitar that was sent to us by a customer. A guitar humidifier and a truss rod adjustment were all that was required to reverse this disastrous situation. Dry guitar with an unadjusted neck. The guitar became “dry” due to exposure to low humidity. It has a sunken top and too much relief or “front bow” in the neck. The same guitar properly humidified and with the truss rod correctly adjusted. A humidifier was placed in the case with the guitar for four days. The guitar absorbed enough water for a weight increase of 25 grams (.90 ounces of water). Low action. Strings are very close to the fret-board. Hump on fretboard where neck joins body. On NT necks, a slight gap around the fretboard extension. Sunken top across the soundboard between bridge and fingerboard. Back of guitar looks very flat when it is dried out. Sharp fret ends extend beyond the edge of fret-board. The plane of the neck angle on a dry guitar hits above the top of the bridge. To maintain a guitar at proper humidity levels, we recommend using the D’Addario Two Way Humidification System (available through TaylorWare). 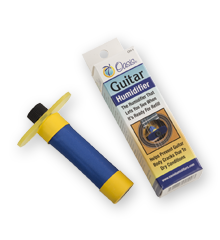 However, to re-humidify a dry guitar, we recommend the Oasis OH-1 or Music Nomad Case Humitar. When using a guitar humidifier, it’s not essential that you place it inside the guitar’s soundhole. As long as you place it in the open area of the case (not sealed off in the pick compartment) and close the case with the guitar inside, the water vapor from the humidifier will be absorbed by the guitar. Even if your guitar is stored in a gig bag, it can still be successfully humidified. It is possible to over-humidify a guitar. As the arches in the top begin to be restored, proceed with caution and check daily. We suggest monitoring the humidity levels with a small digital hygrometer inside the case. A guitar humidifier will restore the body. It will also affect the neck, but to a lesser degree. The frets may remain sharp, and may need to be filed even after the proper humidity level has been restored.